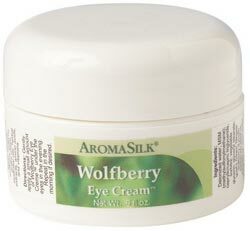 Wolfberry Eye Cream™ eases puffiness and dark circles around eyes, in addition to promoting skin tightening. It may be used before bed and in the morning. Wolfberry Eye Cream™ is formulated from oil that is painstakingly extracted from the seeds of the Ningxia wolfberry. Rich in vitamin E and linoleic and linolenic acids, wolfberry oil has an unusual chemistry that makes it ideal for nourishing and hydrating skin. It is highly regarded by Asian women for its regenerative properties and its ability to protect aging skin and add luster to skin tone. How to use: Gently apply a small amount of creme under the eyes in the evening. Repeat in the morning if desired. Ingredients: Deionized water, MSM (methylsulfonylmethane), caprylic/capric triglyceride, sorbitol, vegetable glycerin, glyceryl stearate, goat's cream, Ningxia (lycium barbarum) wolfberry seed oil, avocado oil, shea butter, kukui nut oil, rose hip seed oil, hydrocotyl extract, essential oils of lavender (Lavandula angustifolia)†, rosewood (Aniba rosaeodora)†, Roman chamomile (Chamaemelum nobile)†, frankincense (Boswellia carteri)†, and geranium (Pelargonium graveolens)†, echinacea extract, sodium PCA, almond oil, jojoba oil, mango butter, sodium hyaluronate, cucumber extract, green tea extract, tocopheryl acetate (vitamin E), soy protein, wheat protein, retinal palmitate, allantoin, witch hazel extract, horse chestnut extract, lecithin, dipalmitoyl hydroxyproline, phenoxyethanol, beta-sitosterol, linoleic acid, sodium ascorbate, mannitol, ascorbyl palminate, ascorbic acid (vitamin C), and citric acid.